Well, I guess it had to happen. 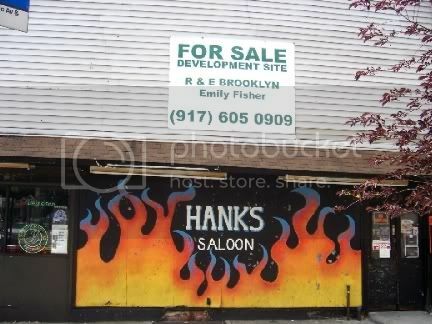 What with all of the development going on in Brooklyn this was just too valuable a piece of land to remain as simply one of the best honky tonk bars anywhere, and certainly in this neck of the woods. I hear that regardless of what goes in here, Hanks will remain. Excuse me if I have my doubts. What will go in here will undoubtedly be housing of some sort because that is where the big bucks are. And it is hardly likely that you would maximize the value of said housing by setting it atop a somewhat disreputable, and certainly loud, honky tonk that draws, shall we say, an interestedly mixed crowd. Oh sure, they may have a bar here (doubtful) and keep some of the trappings of the original Hanks (more doubtful) but it will certainly not be the same. I strongly encourage you to visit Hanks sometime soon so you will be able to say you saw it when. Go on a Sunday when there is free music and free BBQ. It is easy to get to, just take any subway that goes to Atlantic Avenue or take the LIRR. Hanks is just a few blocks away at the corner of 3rd and Atlantic Avenues. If you stop in, be sure to say "Hello" to Jeannie. Absolutely the best honky tonk bartender I have ever run into. And I have run into a few. The Downtown Bar & Grill is located on the corner of Court and Amity, just a few blocks from Atlantic Avenue. I used to go here back when it was Cousin's II. Back then it was a decent enough neighborhood bar and that was good enough. 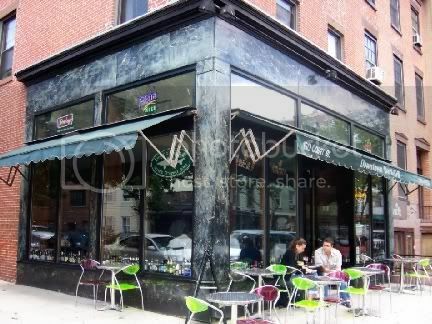 It was sold and is now Downtown Bar & Grill. It still looks somewhat the same, but there has been a definite change in the ambiance. It has, like much of the neighborhood, gone a bit upscale. Not that that is necessarily a bad thing. The biggest change is the increase in the number of beers that are now available. They currently have around 600 available and the objective is to have 1000 by the end of the year. They are also going to start a beer club that will meet once or twice a month and feature hard-to-get beers not available to the general public. Ahh, Barman loves a touch of elitism and has already put his name down on the waiting list. I am going to recommend a bouncer and velvet ropes. I checked out their menu with an eye out for an Australian beer. I am not sure why, but I had been thinking about them lately. Maybe because Bondi Road has recently opened and gotten a lot of press. It is an Australian themed bar and affiliated with The Sunburnt Cow, another Australian place that I have visited and enjoyed. I will have to make a point of hitting Bondi Road soon. But, a digress. The beer menu is arranged by country so I selected a James Boag's Lager. The brewery is actually located in Tasmania, which is an island state of Australia. You learn so much about geography when you drink beer. I had been chatting with Jessica, the pretty and friendly bartender and she served me up my beer and then agreed, somewhat reluctantly, to let me take her picture. I gave her final approval and she said it was acceptable. You be the judge. The beer was okay, but nothing special. It had a nice crisp taste to it with a bit of a bite, due to some hops and its 5% alcohol content. A nice enough beer to quaff on a hot summer day though. 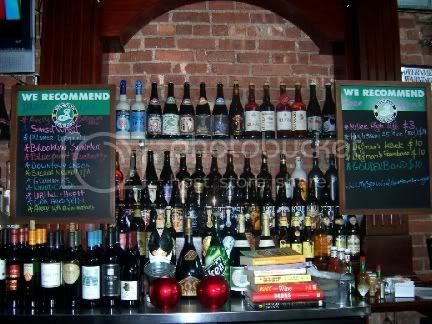 You can see that the bar is serious about accumulating a good supply of beers, many of which they have on display. 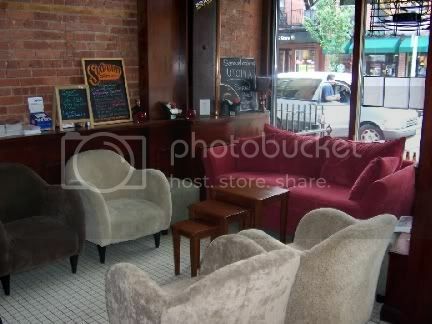 They have a nice little lounge area tucked away in the front corner of the bar, and that is the most noticeable change in the decor from the old Cousin's II. It is a pleasant enough place to pop into for a beer and if variety is your game, you should be very happy here. Matt from Downtown Bar & Grill sent me an email saying that I had gotten some of the facts about the beer club wrong. The beers featured are not hard to get and are available to the general public. The concept is to expose people to quality beers that they might not otherwise try because, usually, they cost more than the casual beer drinker is willing to pay. The idea is to show that a good quality beer can be as complex and flavorful as a good wine. And, while costing more than your average beer, will still cost less than a bottle of wine for which people don't think twice about spending $30 or more. He said the objective would be to remove concepts of elitism, rather than to reinforce them. Well, there you have it. I am still hoping for velvet ropes and a bouncer though.